If you've yet to hear about Kazoku-Ai, then you're truly missing out. 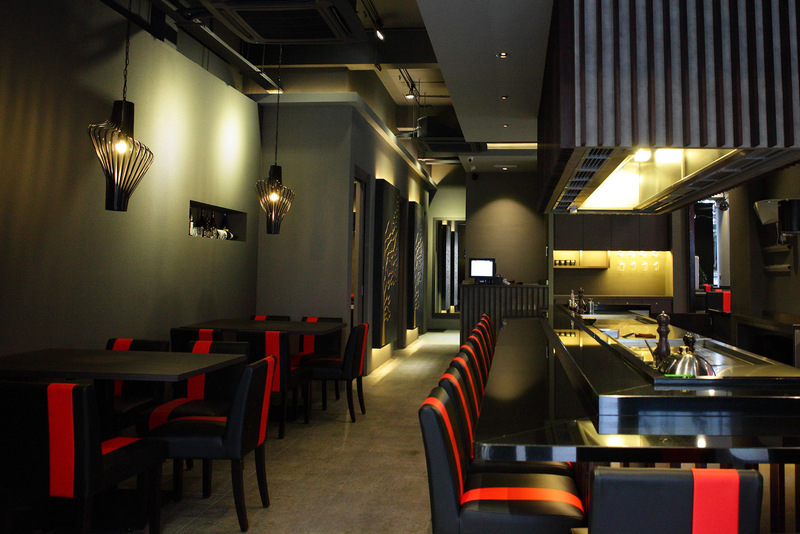 They are known as one of the best teppanyaki places in KL, if not the entire Klang Valley. Using only premium and fresh ingredients, you'll definitely be able to taste the difference in quality from Kazoku-ai. The name "Kazoku-ai" simply means "Family Love", where the dishes and environment are designed to encourage family and friends to gather, relax and enjoy each other's company, with good food and drinks. Eventhough Kazoku-Ai is a teppanyaki themed restaurant, they too offer a wide array of various other dishes that are fresh, delicious and affordable. So without further ado, let's jump in to see what have they got to offer! Starting with a gorgeous plate of Salmon Carpaccio, where the fresh slices of salmon are laid on a bed of oiled-based soy sauce. It is then topped carefully with thin slices of chilli, one on each slice, followed by a bouquet of salad with shredded radish and a generous spoonful of tobiko. The result is a fresh and vibrant way to enjoy sashimi with a twist - both in terms of flavour and texture. This also works great as an appetizer! Next up, 5 large pieces of whole scallops served alongside capsicum and finely sliced fried burdock. It may not look like much but each piece of scallop is well packed with flavour and the bounciness of it is delightful. Another premium appetizer worth going for. Moving on to something a little more solid. This serving of marinated white cod is beautifully pan-fried to perfection, ensuring that the flesh is both flaky and tender while maintaining most of its natural sweetness. It is then served with a julienne of leek alongside mixed greens. The dish itself may look simple, but the flavours and texture are absolutely stunning. For those who crave prawns, this serving of Jumbo Tiger King Prawns will definitely do justice. Firstly, it's huge - almost an arm length at minimum. Secondly, it's done quite simply with garlic and wafu butter sauce, which gives it that added layer of depth without compromising the natural flavours of the jumbo tiger king prawns. Lovely! *The current promotion priced these delicious Jumbo Tiger King Prawns at RM75++ per pair. So get it while it's still cheap! Those that enjoy grilled squid like myself will definitely look forward to this. Not only is the squid fresh, it is grilled to absolute perfection. Not chewy, not rubbery, only pure bliss. The flavours are great and the provided dipping sauces complimented it well as well. One being spicy while the other is sweet. If there's anything that you'll have to order, it is this. The signature Kazoku-Ai Fire Crab. Heck, it is even named after the restaurant, what more do you want? This dish was specially designed by Kazoku-Ai and there isn't anywhere else in the world that does it this way. Hence, you most likely have not tried crab this way if you have not been to Kazoku-Ai. The method of preparation is fairly straight-forward. Live crab, alcohol, teppan, and a heck of a skilled chef. The key is is in the freshness of the crab, that will give most of the flavours and joy. Next, timing, the crab has to be cooked to perfection to avoid any unpleasant texture, which can be a joy-kill if you're hoping for something this divine. The result is a simple but royal-worthy dish that is guaranteed to excite. The tender-soft flesh of the crab coupled with the natural sweet and used of alcohol will leave you craving for more - at least I know I did. All and all, this dish is a must-order and I'll guarantee you that you will not regret it. *Kazoku-Ai Fire Crab requires booking in advance. It is crucial as these live crabs comes in limited quantity. Not to mention that they're all alive and will die if no one orders them. Seafood isn't the only thing you can look forward to in Kazoku-Ai as their humble series of Maki is absolutely delicious as well. The Signature Maki, being one of the most popular, comprises of tiger prawns at the core, unagi, avocado topped with cashew nut sauce. The flavours without a doubt, is tasty but the texture is well above the top. Lovely crunch from the tiger prawns wrapped with fluffy rice and topped with slices of creamy avocado - delightful! The cashew nut sauce too gives the dish that character it needs. Combining two amazing things in one - salmon and cheese, these little nitbits are indeed flavour-packed. Another thing to note is that these are only sold in limited quantities. After all, the core of the Maki is filled with crispy salmon skin, which comes from the whole salmon ordered for sashimi. So once that is used, it's officially off the menu. But always remember to ask as this is definitely worth going for. You have not experience luxury until you've tried this. Known as the Imperial Fried Rice, it is covered wholly with tobiko, with the fried rice done to smoky perfection at the bottom. In addition to that, there is a random treasure at the bottom of the bowl. Be it a giant scallop, or perhaps prawn, you will not know. Only by digging you'll find out. In terms of flavour - this dish is spot on. The richness and smokiness of the fried rice works really well with the subtle yet salty edge of the tobiko. The texture of having these two together too is commendable, with the tobiko bursting at every bite. If you're a fan of both garlic fried rice and tobiko, this dish is definitely worth going for. Lamb lovers rejoice! These little bite-size cutlets are well packed with flavour, with a slight gamey taste that I simply enjoy. Pink on the inside, they're incredibly tender and juicy as well. If that's not enough, there's also a side of homemade wasabi cream sauce with chilli padi to compliment, giving that added layer of flavour. Last but not least, my favourite - beef! I simply can't live without them, no matter how much I have to defy my own religion. Anyway, Kazoku-Ai's Chilled Australian Tenderloin is definitely a dish worth getting gout over. It can be done according to how you like it (but please don't order it well-done). As seen from the photo above, it's done in cubes that fit nicely in one mouthful. In short, it's tender, juicy and seasoned to perfection! 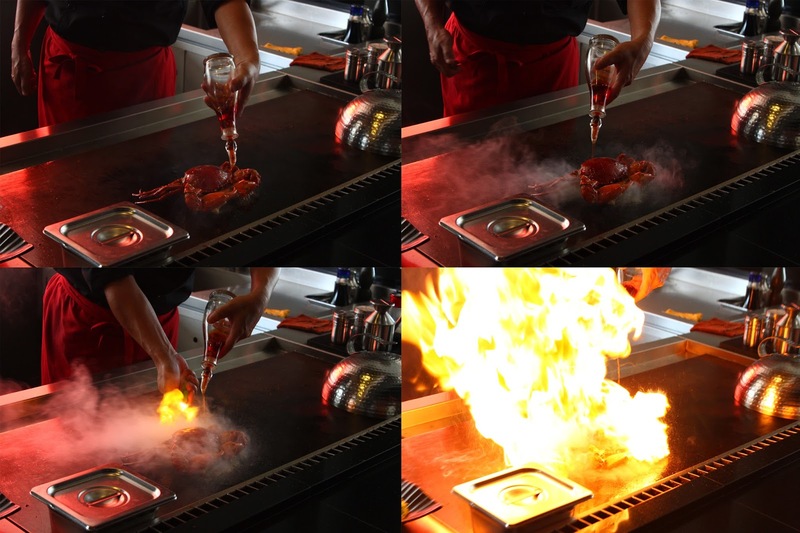 All and all, if you enjoy having quality and premium Japanese food, or simply gourmet teppanyaki at that, then Kazoku-Ai is one restaurant worth visiting. The price may be a little steep, but the quality and result do justify its cost. Furthermore, Kazoku-Ai also offer award-winning Sake for enthusiasts and regular Sake for those who simply wants to drink a glass or two. Request for a recommendation if you do not know what you like and I'm sure they are more than willing to help.